What is the Yelp Compliance Form? Yelp continues to emphasize the importance of reviews being authentic testimonials from real customers, not fabricated or paid for by individual companies. 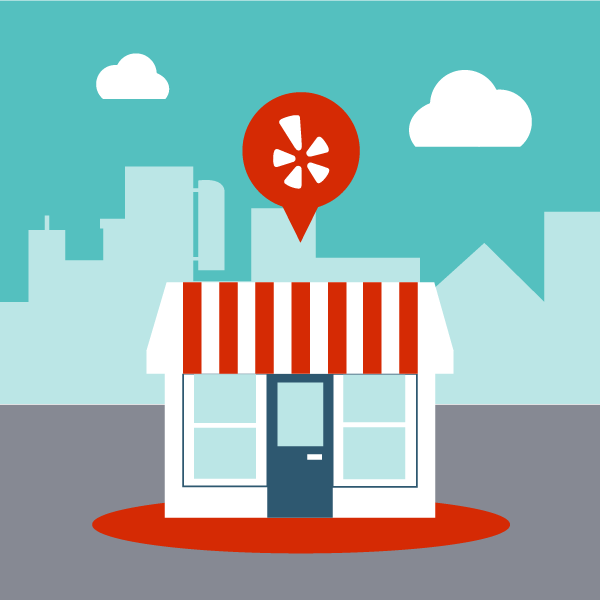 Recently, Yelp has begun issuing a warning to businesses that appear to be soliciting reviews on Yelp. Along with this warning, Yelp asks you to fill out a Compliance Verification form where you pledge to not solicit reviews on Yelp. After you’ve filled out this form, Yelp will take 30 – 45 days to review your answers and confirm that you, in fact, are not using any third-party software to collect Yelp reviews or directly asking customers for Yelp reviews. Question 1: Do you understand that asking for reviews is against Yelp’s policies? Correct Answer: Yes. This one’s obvious, and if you answer “no” you shouldn’t be filling out this verification form in the first place. Question 2: Do you use a reputation or review management company? (Many of these companies solicit reviews). Correct Answer: If you do use a review management software, the correct answer is “Yes, I do use a review management company, but the company has removed Yelp from the system entirely.” If you do not use a review management company, the correct answer is “No”. Question 3: Have you stopped soliciting reviews, either directly or through a reputation management company? If so, when did you stop and what steps have you taken to ensure that you no longer ask for reviews? All of your answers to the Yelp Verification form need to be truthful. If they aren’t, adjust your processes and then fill out the form. If you have an Yelp business account, log in and see if you’ve received this warning, then fill out the form as soon as you can. When you’ve successfully submitted your form, you’ll see a green box confirming it has been sent to Yelp. Businesses that fail to comply will be demoted in Yelp search results. 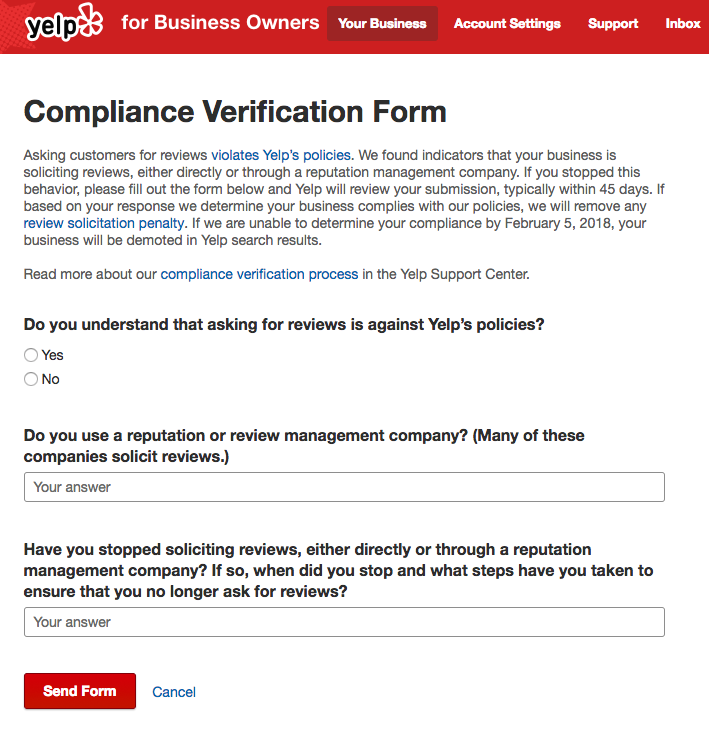 Yelp Compliance Form Answers takes its rules seriously and will filter out your reviews without hesitation. It’s in your company’s best interests to abide by these rules. It’s a lot easier to make a few changes and answer 3 little questions than it is to get your ranking back up after Yelp filters out all your reviews. So if you’ve received this notice and haven’t filled out your form yet, hop to it! This article was written by one of our reputation management partners, André Pimental.